If there are times or days you don't want to be available for booking, you can block out time directly on your linked calendar. Any existing event in your calendar set to busy will block your availability from showing up on your Youcanbook.me page. To block off hours or days, create a busy event in your linked calendar. When you have blocked your time, YouCanBook.me will show you as unavailable for bookings. Create an event on your Google, Microsoft or iCloud calendar for the relevant timeframe. Set the event to 'Busy'. You can set the event to be a repeating event if you want to block the same time off every week. All day events are a great way to block off holidays without them taking up your whole calendar. However, all day events default to "Free" so be sure to check that the event is set to "Busy"
iCloud users will need to use their iPhone or iPad to change the free/busy setting. This isn't available on the desktop. If you're using our Units per Slot feature, one 'Busy' event won't block them all of your available time slots. Please take a look at the Units per Slot help page for tips on how to "soak up" multiple units with one event in your calendar. You can use the 'break' feature on the Availability section. That will permanently block that period on every day you're available. If your schedule varies from week to week, or you don't want to create busy events in your calendar, you have another option - to use our Custom Availability feature. With this feature on, you will indicate when you are available for booking by creating free events in your linked calendar. We will only display these times as available for booking. 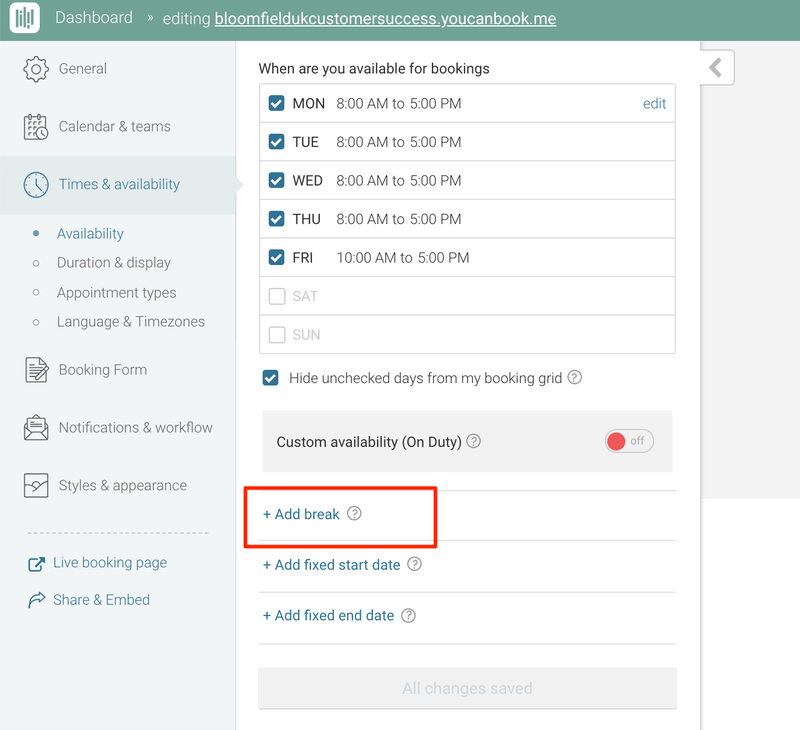 This gives you complete control as you can add or remove blocks of time as your availability changes, without having to log into Youcanbook.me. All of the changes to your availability are made on your linked calendar, and Youcanbook.me will automatically update.